. 375" høy blade lar deg null modell 96 svensken og andre poenget med sikte. Firkantet innlegget bladet gir en lett-å-se, veldefinert syn bilde med problemet bak severdigheter. Rikelig med ekstra materiale slik fil og forme bladet opprinnelige kontur eller en egendefinert figur. 5.26mm svalehaleføringen passer Mauser framme base. Passer de fleste Mauser 91 gjennom 98 rifler med militære synet base. Spesifikasjoner: stål, blånert, matt finish.. 077"(1,9 mm) bred. 375» (9,5 mm) høyt over 81 ° x. 207" x. 081" dovetail. Krever mindre montering. This front sight is now legal for CMP's Vintage rifle matches. Most Mauser front sights are too short for regulation at 100 or 200 yds and their pyramid shape is harder to see than a square partridge style blade. This blade is easy to install and file the height to regulate to 100 yds. A little cold blueing after filing and you're in business. I have used them on my Swede M-96 and German K-98. Excellent replacement of stock military sight; easily filed to proper height. Flat top easier to see than stock military sights. Would buy again. These sight blades save me heaps of time when setting up a good service rifle, I used to have to weld up all my Swedish mauser sights to get them to shoot to the point of aim but with these inserts I just file them to height plus since they are square they provide a better sight picture. I have a 1928 Carl Gustafs Swedish Mauser. I was able to locate an original competition rear peep sight for it...only trouble was that the original front sights was way too low. After trying to find original sights, I stumbled upon this one. It DOES require fitting, so get out your small precision files, and sandpaper, and spend some time doing it right. After about 30min filing, I had it fit. As for the height? 100% correct. The rifle now shoots point of aim and in line with the yardage numbers on the peep. Nice quality, and nice flat finish. I recommend this product. Just put this on my Yugo M24/47. The original front sight was installed from the RIGHT looking at the target so tap it out from the LEFT side. The bottom of the new sight base had to be filed down by about 0.01 inch to fit. Also filed down the base corners every so slightly to alow easier installation. Put Frog Lube on it to prevent rusting and help slide it in place. Put some red fluorescent paint on it and checked windage while looking through barrel at yonder pine tree top. Off to the range with it now! The paperwork says minor fitting may be necessary. Thats an understatement. Will not even come close to fitting K98, M48, M24/47 Mausers. I have all three and this sight is nowhere close to fitting without major modifications. The dove tail angle is incorrect, its too thick, too long and too wide. It doesnt even fit the specs that Brownells publishes. 4.5 hours with a file and i am still trying to get the thing to fit. i see all these good reviews, i guess i am the lucky one that got the lemon. I found this item to be somewhat irritating simply because the dovetail angle is incorrect, on my 1915 M-96 Swedish Mauser. The angle is not as steep as the factory dovetail cutout, and this causes you to have to reshape the angle. I don't mind flling/sanding; but the angle should match the Factory cutout...it does not. My Mauser was shooting high. I bought brownels front sight and used a set of needle files. The sides of the dovetail were steeper than that of the front sight so I filed to fit. Be careful how much you take off the sight it needs to fit tight. I used my micrometer. I was able t fit it well and shot at the range. Of course it shot very low so I filed the top of blade and made fast adjustments. I got it shooting dead on and it is better than the factory sight. I wish there was a rear replacement as the Mauser rear is a bit junky. This replacement blade is all you need and will work fine on any Mauser that I can imagine. some fitting will be required becausethere is too much variation from Mauser to Mauser. By it you will be happy have a smith place it if you can't. This is a very good product I'm glad I bought it. Took about 20 minutes with a couple files and was good to go. Fit my Yugoslavian m24/47 but had to take .020" off the bottom with a flat course file and I used my triangle shaped file on the dove tails to get those to fit my base. It's about .200" taller than the one that was on it so hopefully I'll get the impact where it should be. Not a foot high at 100 yards. Just remember it's made big so you or your gunsmith can fit it to your rifle. .375" Dovetail Front Sight Blank Steel Black 050806101524 . 375" høy blade lar deg null modell 96 svensken og andre poenget med sikte. Firkantet innlegget bladet gir en lett-å-se, veldefinert syn bilde med problemet bak severdigheter. Rikelig med ekstra materiale slik fil og forme bladet opprinnelige kontur eller en egendefinert figur. 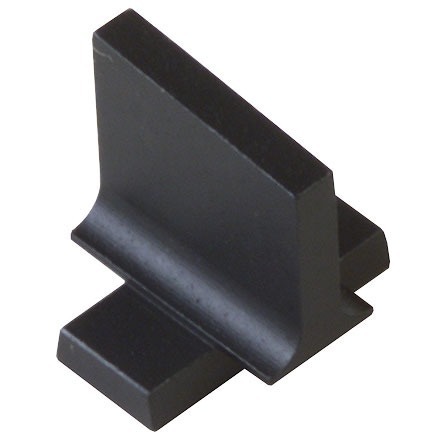 5.26mm svalehaleføringen passer Mauser framme base. Passer de fleste Mauser 91 gjennom 98 rifler med militære synet base.